David Gnass was born in St. Catharines, Ontario. While his artistic talents were encouraged during his schooling, it was a natural ability he did not value in his youth. It wasn’t until the late 90’s that Gnass, then living in Toronto, began to paint. 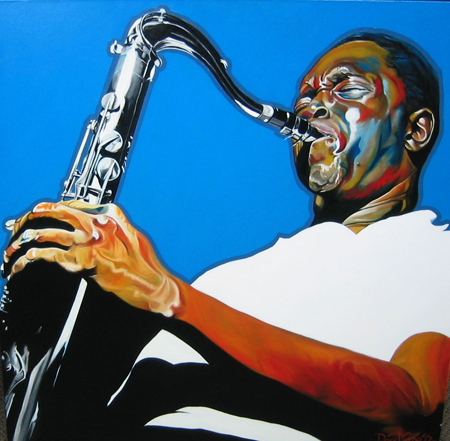 Gathering inspiration from his love of jazz music, he took two years from his working career and developed his distinctive style. “By keeping the backgrounds as only a complimenting bold colour contrasted by a dark solid it is my hope that viewers can then give their full attention to the subject. In the subject I try to capture the essence of the “jazz state” through use of various striking colours or bold monotones”. In 2004, Gnass began to paint landscapes. Drawing from the inspiring works of the Group of Seven and their contemporaries he set out to develop his own interpretation of the wonders of our created world starting in his backyard of Ontario.